Happy (almost) Spring everyone! 23 more days, but who's counting ;) Even my 4 year old is feeling the effects of the winter dull drums...he has been insisting on wearing shorts and tee-shirts around the house, and he keeps asking when summer will be arriving. My Tuna Casserole with Spinach recipe is actually a new and improved version of a similar dish I posted almost two years ago - Hearty Tuna and Penne Casserole ... this time around, I replaced the peas with spinach and used more Parmesan cheese on top to create more of a crust on top. Hope you enjoy! Step 1: Cook pasta according to package instructions. Drain and set aside. Step 2: In a large pot or dutch oven, add the tuna, spinach, sour cream, ricotta, milk, and half of the Parmesan cheese. Heat over low and stick with a whisk until sauce starts to turn creamy. Season with the garlic and onion powders, and add salt and fresh ground pepper to taste. Stir in the cooked pasta and mix until well combined. Step 3: Prepare a 9x13 baking pan with cooking spray. Add the noodle mixture, then top with the remaining Parmesan cheese and panko breadcrumbs. Bake in a 350 degree oven for 30 minutes, then brown under the broiler for an additional 2-3 minutes if desired. I absolutely love shrimp dishes and would probably make them a lot more often if I wasn't on a grocery budget each month. But, for a splurge nice meal, they are perfect and the recipe ideas are endless. I have been making this dish (or similar variations of it) for several years. For Christmas one year, I made my whole family custom cook-books with some of my favorite recipes, and this is the one that I received the most positive feedback about, so I had to share it on the blog. This dish can be served on top of your favorite rice or quinoa, and is also fantastic on top of a bed of fresh greens. It's also really easy to adjust the spice level to your liking, so feel free to use less coriander and curry and eliminate the crushed red pepper flakes if desired. Hope you enjoy! Step 1: In a large skillet (I use my cast iron) over medium high heat, add the coconut oil and allow to melt in the pan, then add the shallots and garlic. Saute 2-3 minutes, then add the carrots and red bell pepper, seasoning with a sprinkle of salt and pepper to taste. Saute for an additional 2-3 minutes. Step 3: Add the shrimp and the chia seed. Continue cooking over medium-low heat until the shrimp are pink and the chia seed has thickened the sauce to your liking. Garnish with fresh parsley and serve over rice, quinoa, or over a bed of fresh greens! Hope you enjoy! Shrimp Fra Diavolo is hands down my husbands favorite shrimp dish, so we make it frequently. We first discovered Fra Diavolo sauce at our local Italian restaurant, and we both fell in love with the spicy deliciousness. And in case you were wondering, Fra Diavolo is Italian for "Brother Devil", which is a bit comical. I had figured that it would be overly complicated to make the sauce, but it turns out it is quite simple - which is probably another reason we make this dish so often. In my sauce, I use a combination of fresh and canned tomatoes (I use the Muir Glen brand because the taste is outstanding and I also appreciate the BPA free packaging). I prefer to the combination of canned and fresh tomatoes, because I feel it adds to the texture of the dish in a very positive (and tasty!) way. We usually serve Shrimp Fra Diavolo over whole wheat pasta, but it also great over cooked quinoa. I hope you enjoy this dish as much as we do! Step 1: In a dutch oven or deep saute pan, add the olive oil, onion, and garlic. Cook over medium high heat, until the onion and garlic and slightly brown. Step 2: Add the crushed red pepper flakes, and the fresh and canned tomatoes. Bring the sauce to a boil, then reduce heat and simmer an additional 5-10 minutes, or until sauce starts to thicken. Step 3: Add the peeled shrimp to the pan, then season with the salt and pepper as desired. Step 4: Cook until the shrimp are pink and cooked through (careful not to overcook, otherwise they can get rubbery), sprinkle with fresh parsley and serve over pasta or quinoa. Hope you enjoy! Cheers to Summer 2016!! I love salmon so very much...a delicious and rich taste, highly versatile, packed with nutritional goodness...love, love, love. And, with just a handful of ingredients (all of which you probably have on hand already in your pantry) you can take the flavor of this fish to the next flavor level! Week-night meal, date night meal, or even for casual entertaining...this dish has you covered! Step : Prepare the glaze...combine the maple syrup, paprika, cumin, cayenne, salt, and pepper. Whisk well until smooth and well combined. Step 2: Pre-heat your over to 350 degrees. Lay the salmon fillets on a baking sheet covered with aluminum foil and coated with cooking spray (less mess). Coat the fillets generously with the glaze. In the pre-heated oven, bake the salmon for 18 minutes, re-applying the glaze to the salmon half-way through cooking. 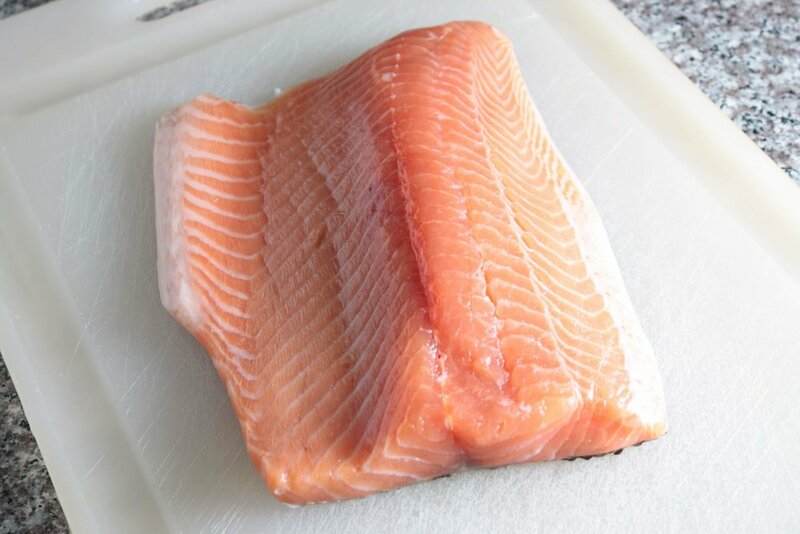 When the salmon is fully cooked, it should be very easy to peel the skin from the flesh of the salmon fillets. 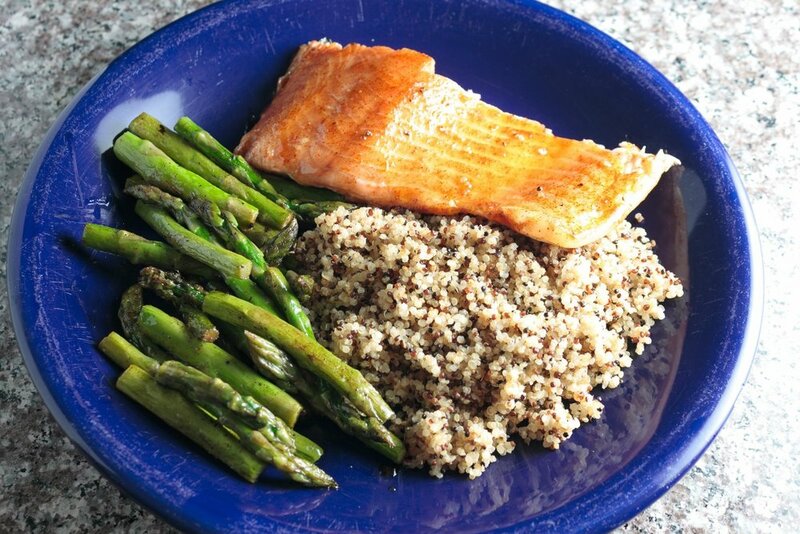 I served the cooked salmon on a bed of garlic quinoa with a side of steamed spinach. The combination was phenomenal! Hope you enjoy!! I have been trying to perfect this Tuna and Penne Casserole for the last few weeks. My main goal was to create a hearty, healthy casserole without using any processed soups. This recipe comes together very easily, and can be made prepped in advance and tossed in the freezer for an easy, weeknight meal. Step 1: Cook penne until well done (not al-dente) and drain. Pre-heat the oven to 350 degrees. Step 2: To make the sauce, combine the sour cream, ricotta, parmesan, milk, salt and pepper together. Whisk together until the sauce becomes smooth and creamy. Step 3: Add the tuna and the peas to the sauce mixture. Step 4: Add the cooked pasta to the sauce and tuna mixture and mix thoroughly until well combined. Step 5: Coat a 9x12 baking pan with cooking spray. Pour in the entire contents of the penne and tuna mixture and sprinkle with the breadcrumbs. Cook for 35-40 minutes.